Montgomery Scott was born in Scotland on Earth in 2222. He spent part of his life in Aberdeen, once referring to himself as an "old Aberdeen pub-crawler." Upon being asked how he adjusted to space travel, Scott once admitted, "I was practically born to it." He joined Starfleet and began his engineering career in 2241. During his 51-year career in Starfleet, he served on a total of eleven ships, including various freighters, cruisers and starships. He also briefly served as an engineering advisor on the freight line between the Deneva colony and the outlying asteroid belts. He was the writer of several technical manuals, which included Operating Protocol - Flow Sensors. A copy of this manual was stored in the Engineering Systems Database aboard the USS Enterprise-D in 2366. He was also responsible for writing Starfleet Regulation 42/15, entitled "Pressure Variances in IRC Tank Storage", which was part of the basic operational specifications for impulse engines. These specifications were admittedly written "a wee bit" conservatively. 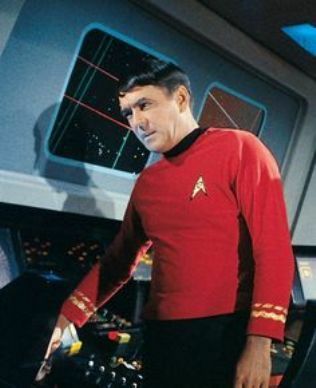 In 2265, Scott was assigned to the USS Enterprise where he served as chief engineer under Captain James Kirk. The Enterprise was the first ship on which he was the chief engineer. His duties also included maintenance and operation of the Enterprise's transporter systems. Three of his top engineers included Lieutenants Kyle, Leslie, and Gabler. As the ship's unofficial second officer, Scott assumed command when both Kirk and Spock left the ship, or they both were incapacitated. Thus, he often faced critical diplomatic and military situations. Despite being a capable command officer he never pursued his own command post because he "…never wanted to be anythin' else but an engineer." By the late 2260s, Scott knew more about the warp engines aboard a Constitution-class starship than the men who designed them. This knowledge and ability to save the ship in a jam eventually led to his reputation aboard the Enterprise as a "miracle worker." This was brought about by his reputation for being able to effect starship repairs faster than usually required. Scott later admitted that he often padded his estimates of time needed for repairs by a factor of four in order to appear that much faster.